I’ve always been fascinated by Anne Boleyn and her tragic story. After refusing to become king Henry VIII’s mistress, she eventually married him after causing a schism in the Church only to be executed three years later for crimes that she (very probably) never committed. The story of her fall is as interesting, and a lot more mysterious, than that of her rise and although many books about Anne and the Tudors talk about it, never before had a book been entirely dedicated to it. So, when I found out that Alison Weir was gonna release a book, called The Lady In The Tower, about Anne’s fall, I couldn’t wait to get my hands on it. The book covers every aspect of Anne Boleyn’s fall: its possible causes and who wanted her dead, the men accused to have committed adultery and have conspired against the king with her, theirs and Anne’s trials and executions, who was on the jury that condemned her, how her contemporaries reacted to the scandal and how it affected her daughter Elizabeth. Nothing is left untouched. I wouldn’t say this is a groundbreaking book as none of the theories examined in it are really new, but nevertheless it is still an interesting book that tackles all the questions one might have on the subject. Why was Anne accused and condemned? Did Henry, tired of his wife and convinced that their marriage displeased God, organize her murder? Or was Anne the innocent victim of a well-orchestrated plot against her and her faction planned by Thomas Cromwell, who argued with the Queen on political and religious issues and was afraid she would have destroyed him? Or was she, simply, guilty as charged? And also, how was the investigation conducted and what proof did the accusers have against her? Was her trial fair? Why was she found guilty and why was an executer from France called to England before the trial was over and Anne found guilty? How did Henry act during all this? To answer all these questions, Weir examines all the available pieces of evidence (taking most of her information from contemporary primary sources whenever she can) and how reliable they are, allowing the reader to follow the events and make up his/her own mind on what happened. However, I have a couple of gripes about this book. First of all, I wish she hadn’t dedicated a small section about the “legends” associated to Anne Boleyn, that is the occasions when her ghost was apparently seen. It was just superfluous in my opinion, especially in a scholarly work. This space could be better dedicated to exploring the culture and society of this time, something that lacks in this book. After all, to understand how this scandal and murder could have happened, we need to understand the English society in the Tudor era during Henry VIII’s reign. Overall, I really enjoyed this book. It is well researched and long but it flows easily, the writing is clear, accessible and fascinating. Highly recommended to all those who are interested in Anne Boleyn and the Tudors. 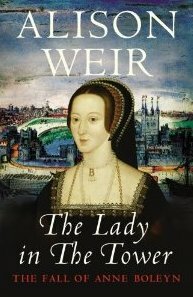 Overall, The Lady In The Tower by Alison Weir is a fascinating read, especially for those interested in Anne Boleyn, her fall and Tudor history in general. In it, every aspect of Anne’s fall is covered. The theories examined aren’t groundbreaking, but they are backed up and supported by historical evidence, with particular emphasis on primary sources. Although long, it is also well-written and flows easily. However, information on Tudor society at the time is lacking and I thought that the section dedicated to the ghost of Anne Boleyn was superfluous. I’m sure some people will enjoy that too though.